FAA regulatory action requires all operators of commercial transport aircraft with cargo compartments, including those originally designed as Class D (no fire detection or extinguishing required), to have fire protection equipment. Using Kidde Aerospace & Defense components, Aerocon Engineering Company has developed and certified (STC'd) complete systems in order to support Class D retrofit programs, as well as any other cargo bay applications. The control panel is installed in the cockpit, and provides annunciation and control for up to three separate compartments per panel. Controls are laid out in a simple pattern, with easy-to-read warning and status indicators. A press-to-test button performs a comprehensive check of the entire system. Additionally, the panel provides all the necessary cockpit interfaces (fire bell, master caution, and master warning). The panel is compatible with all ETOPS configured aircraft. The innovative electronic design permits this high false-alarm immunity without compromising speed or response, resulting in a system that is extremely responsive to rapidly growing fires with limited smoke production. The only maintenance required is a cleaning during heavy ("C" or "D") maintenance checks. The electronics unit provides an alarm and test interface between the smoke detectors and cockpit panel. 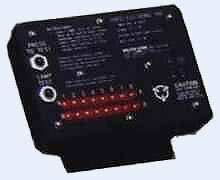 The test switch and LED indicators allow faults to be isolated to individual smoke detectors. To minimize wiring, this component is typically installed in the cargo compartment, but can also be located in the electronics bay. The unit's "fit-and-forget" reliability is gained by using simple, reliable design techniques and microprocessors/software requiring maintenance or updates. Aerocon's extinguishing units are provided from vendors with over 80 years of experience producing quality, durable fire suppression equipment. Extinguishers are sized to fit the cargo compartments; various sizes are available to suit a wide variety of applications, including ETOPS. 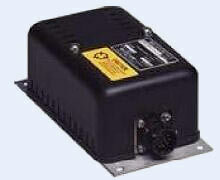 Output rates can be selected for fire knock-down (high) or metered (low) operation. The units are light weight, hermetically sealed Nitronic 40 stainless steel designs with high reliability, long-life cartridges. 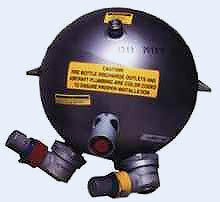 The US DOT hydrostatic test interval for the cartridge is up to 14 years. All pressure switches and gauges are temperature compensated for high reliability, and can be checked while on the ground. Typically, the extinguishers are configured to use the FAA-specified Halon 1301, but other extinguishing agents are available if required.